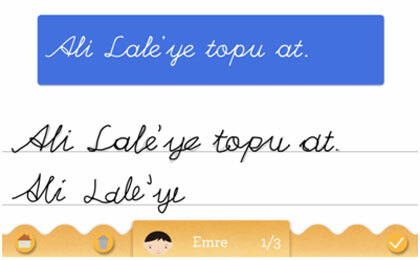 What is the Turkish handwriting recognition system, and how does it work? Handwriting recognition is the automatic recognition of inputs made by a person using a stylus or touchscreen, and the conversion of those inputs to machine-readable language. Handwriting recognition has been a global issue since the 1960s, and has led to the development of OCR (Optical Character Recognition) and ICR (Intelligent Character Recognition) for handwriting. Like speech recognition, handwriting recognition aims to facilitate human-machine interaction. For example, converting handwritten notes taken onto tablets or phones into searchable documents presents an alternative to typing on a small keyboard. Are there examples of this around the world? How do they compare to the Turkish application? Handwriting recognition for English has been incorporated into tablets and telephones since the 2000s, but the problem is more complex in Turkish due to its agglutinative morphology. In simple terms, the signal generated by the input using a stylus is checked against the entries in the lexicon using machine learning techniques. 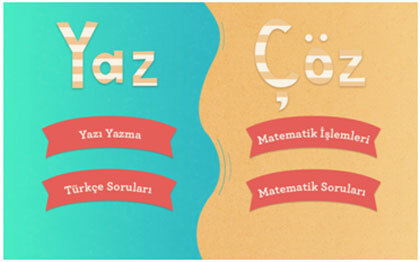 Since the lexicon in Turkish is very large and words appear similar to each other (e.g. gittim, gittin, gitti...), system accuracy is lower compared to English (above 90% with a smaller lexicon; around 70% with a large lexicon). Starting with my PhD dissertation, I have been working on writing recognition in English and Turkish, both from images and tablets (image + time code). This year, my PhD student Esma Bilgin Taşdemir defended a dissertation on this subject. Our work was supported as part of the TÜBİTAK 1003 project, and we developed the most advanced recognition system for Turkish, as well as modules and interfaces intended specifically for use by primary school studens. Almost all students preferred using tablets to solving questions on paper; however, the work is not yet in the product phase.